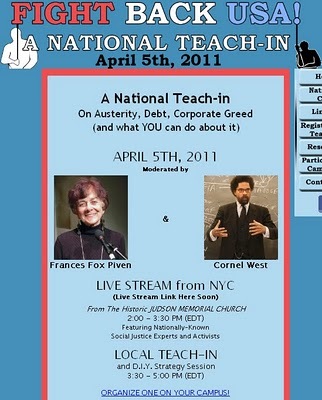 I posted here on an upcoming national activist “teach-in” on “Debt, Austerity and Corporate Greed” being organized by Democratic Socialists of America leaders Frances Fox Piven and Cornel West. Jeffrey Sachs – One of the most dangerous socialists on the world stage. Sachs is Director of the UN Millennium Project and is Special Advisor to United Nations Secretary General Kofi Annan. He is also the Director of The Earth Institute at Columbia University. Sachs is a long time beneficiary of funding from George Soros-controlled organizations. Sachs addresses the Party of European Socialists in Prague, Czech Republic, 6-7 December 2009, calling for higher taxes in the U.S. and worldwide re-distribution of wealth. Heather McGhee – Washington office chief of Demos, a radical New York “think tank” closely tied to Democratic Socialists of America and the far left Institute for Policy Studies. Barack Obama was a founding board member of Demos in the early 2000s, while Obama’s one time “Green Jobs Czar” and “former” communist Van Jones served on the board of Demos a few years later. Five of the most influential socialists in the country are inciting thousands of young college age activists to take to the streets of America. Great post Trevor and thanks for revealing this information. As a college student myself it is sad for me to see just how liberal my peers are. Several polls have come out recently that show support for Socialism is up, especially among those who are in my age group. It seems like it is the cool thing to do. I believe that is in part due to the dumbing down of education (college students who can think critically are few and far between), and another part due to being part of the cool crowd. People my age want to be seen as hip and trendy, so they go against traditions (free market/constitutionalism) for that which has traditionally been looked down upon (socialism) and they embrace it giving absolutely no thought as to why or if it is better than that which they are rejecting. At the end of his talk in the video, Sachs asks that the European Socialists to “make common cause with the progressives of the United States…”. He is a member of the scientific committee of the Fundacion IDEAS, Spain’s Socialist Party’s think tank. …This conference reflects INET’s dedication to inspiring and provoking new economic thinking. More than 200 academic, business and government policy thought leaders from around the world will be attending. In 1944 the United States government chose the Mount Washington Hotel as the site for the first Bretton Woods Conference, which established the World Bank and chose the American dollar as the backbone of international exchange. The meeting provided the world with badly needed post war currency stability…. “The Bretton Woods Institutions” is an umbrella term that may sound familiar. It refers to a diverse group of actors on the international financial scene: the World Bank, the International Monetary Fund, the World Trade Organization, and the numerous Regional Development Banks. The Bretton Woods Institutions, or International Financial Institutions (IFIs) work together to create a comprehensive network of resources and regulators. Through the IFIs, trade is fostered around the world, development projects are pursued, and the international financial system as we know it is debated and discussed by nations and private interests…. You do terrific work Trevor. Thank you so much. Thank you, bronxville. Gulag Bound has been covering Soros’ actions about this from March 22nd and will continue to. Feel free to post from this site.